This altbier is brewed in the capital of Alaska, Juneau by the oh-so-creatively named Alaskan Brewing Company. 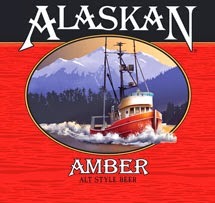 Alaskan Amber is one of those American beers that is a must try in its genre. I first tasted it in Colorado at a minor league baseball game (doesn't that automatically make it taste extra special?). It looks great in a glass. Alaskan Amber has a ruby brown color with a light off-white head. It's exactly what this sort of beer should look like, and its color makes it really inviting. Its aroma is very malty, with hints of caramel and spicy floral notes. As expected, the beer is also tastefully malty with some minor hints of hops, just so you know they're there but not a major player. It leans toward a sweet maltiness, with the caramel leading the way. Amber isn't a heavy beer, but it's also not light. It sticks in your mouth a little, leaving some flavor behind which is great. This is a really refreshing beer because of the medium body and can be enjoyed any time of the year, and with an ABV of 5.3% it isn't overly alcoholic. Bohemia looks great in a glass with it's pale golden color and big, white foamy head. The smells are mostly of corn and malts like other Mexican beers, but this one is a little bit stronger and there seems to be more hop smell coming out which is nice for a change. This beer isn't the normal American adjunct lager like most of the Mexican beers I've tried. There's a perfect amount of hops in it to give it a little more going on than most from the country. There's a good balancing with malts in here too so it's not too close to a pale ale, and there are even some citrus flavors in it which are strong enough to not require the addition of a lime! It's a great, lighter beer to drink that isn't too watery. I'll be honest, I was shocked when I first drank this beer because I assumed it would be similar to other Mexican beers I've had, but was pleased to be proven wrong. This has definitely challenged for a place as my favorite Mexican beer. There's almost no head with this beer, but the color is a brilliant, gold straw color in the glass. It smells mostly of grains and corn again, but doesn't even have a little hop smell coming through and overall the entire smell is pretty weak. The taste is what you might expect from a Mexican lager, it's extremely light and watery, with mostly malt and corn flavors but there are enough hops that keep it from becoming too dull. It doesn't taste flat which is great and makes it a lot nicer to drink. Overall, there isn't a lot of exciting things going on with this beer but it's not a bad beer either. It's well-adjusted in all the important ways and would be a good choice if you're looking for an alternative beer that's not going to turn you off. Another great beer for a hot, sunny day from Mexico. This one's name, Sol, meaning sun is perfect for it. It pours a bright gold with good looking foam in the glass and brings the beach to mind. The smells are most malts and corn, but there is just a tidbit of lime that implants the great idea of adding a wedge of the citrus fruit to it, making the taste really pop. It's a lighter beer with mostly grain tastes and just a little bit of a hop bite. There's not a lot complex going on with the flavors in this one, just a simple and enjoyable beer, but one of my favorites from Central America. I'd definitely recommend adding the lime for some extra flavor. Tecate looks similar to many other Mexican lagers in a glass, it is a pale straw/yellow color with light head that disappears quickly leaving a mostly flat looking beer. Its smell is good and more complex than many others, including the regular sweet corn and grains but also grass and fruity smells as well. The flavors are much like the smells but malts come out a little bit stronger here, and it's watered down way too much. Some sour fruit flavors come out at the end which make it slightly unpleasant for me and ultimately hurt the otherwise mild beer. It's also a little heavier than other Mexican beers, but is still a very light brew overall. I would recommend several other similar beers over Tecate but it's not a terrible alternative to the big hitters like Dos Equis and Corona. Pacifico is a great beer for a hot, sunny day which is perfect for its homeland, Mexico. It pours a light gold color and while looks a little watery, it isn't nearly as bad as some other Mexican beers. There isn't much of a hop smell to balance the strong, grainy malts when you give it a whiff but this is made up for in the taste where there is just enough of a bite at the end to give the beer a little pizzazz. The flavors are mostly of grain, a hint of corn flavor, and a little bit of hops. It's light and refreshing, and doesn't leave any sticky residue in your mouth although it doesn't leave much flavor in your mouth after swallowing either. The unfortunate trend of watered down flavors doesn't help, but Pacifico is definitely a Mexican brew I can recommend. Like I said, if you're looking for something refreshing for a hot day, this one will quench your thirst. Also, much like many other Mexican beers, it's great with a lime wedge for a little bit of extra citrus flavor. 100-90: Great beers, must try! Hall of Fame. 89-85: Really, really good. Absolutely 100% recommended. 84-80: Good beer, stands out. Recommended. 79-75: Good beer, nothing special, and does not stand out. Will recommend to people. 74-70: Average beer. Probably would not recommend to friends. 69-60: Below average. Actively discourage friends from trying. 60-0: Reserved for the beers that I will turn down if offered. Remember: All beers have their place! Recent reviews by Nathan E.